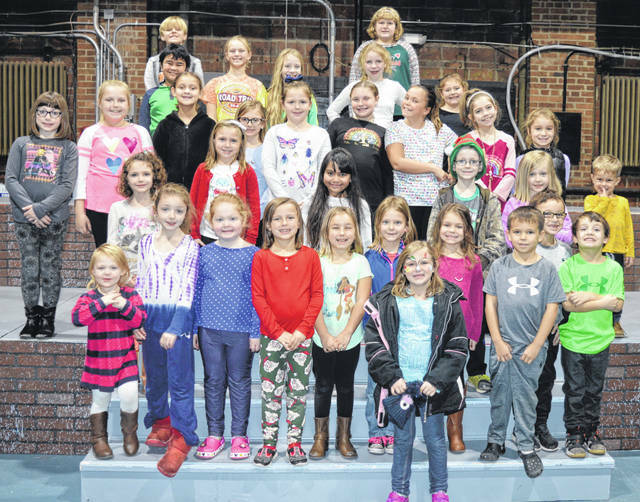 Here are many of the Murphy Kids, who have a featured part in the annual Christmas show at the Murphy Theatre, where all new seats were installed this summer. The annual community holiday variety show is directed by the theatre’s artistic director, Timothy Larrick, in the foreground at left. 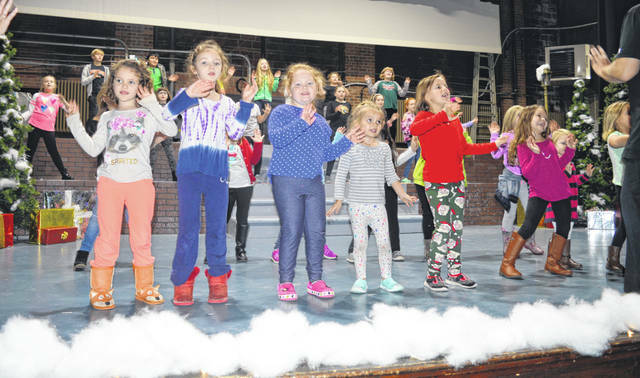 The Murphy Kids rehearse a number for this weekend’s “Murphy’s Christmas Carols”, presented by the Clinton County Convention and Visitors Bureau. The children have both words and moves to remember. WILMINGTON — Plenty of good tickets remain available as a Wilmington holiday tradition returns this weekend with the Murphy Theatre’s Christmas show “Murphy’s Christmas Carols”, presented by the Clinton County Convention and Visitors Bureau (CCCVB). The annual community holiday variety show is directed by the theatre’s artistic director, Timothy Larrick. This year’s show will feature the Murphy Singers, the Murphy Choir, the Murphy Kids, Wilmingtones, the Falconettes, Fancy Free Cloggers, and Turn Out Dance Academy. 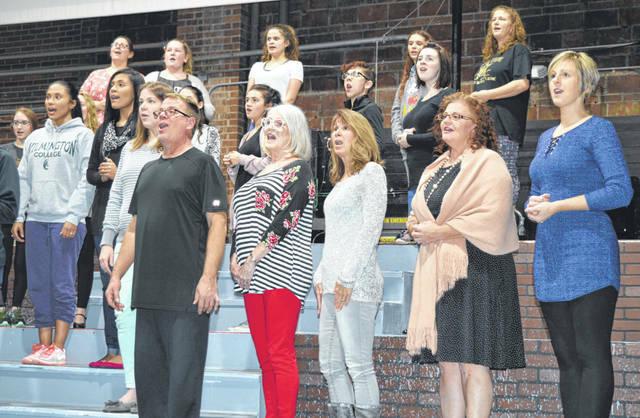 “This year we are still following the Christmas variety show format, but the whole show is dedicated to old-fashioned Christmas caroling and carols — with updates and all new arrangements, so you will hear them as never before,” Larrick said. The show is “sure to bring smiles to everyone’s faces and warmth to everyone’s hearts,” added Larrick. And he has the feeling that by the end of the show, some audience members may be dancing in the aisles. Showtimes for this fun family event are: Friday, Dec. 7 at 7:30 p.m.; Saturday, Dec. 8 at 2 and 7:30 p.m.; and Sunday, Dec. 9 at 2 p.m.
Tickets for Murphy’s Christmas Carols sponsored by the CCCVB are available online at www.themurphytheatre.org , by e-mailing boxoffice@themurphytheatre.org , calling 937-382-3643 or stopping by the box office at 50 W. Main St. between 10 a.m. and 3 p.m. Box office opens one hour before events times. Ticket discounts are available for parties of 20 or more.